"I am a Leeds fan from Stoke on Trent. 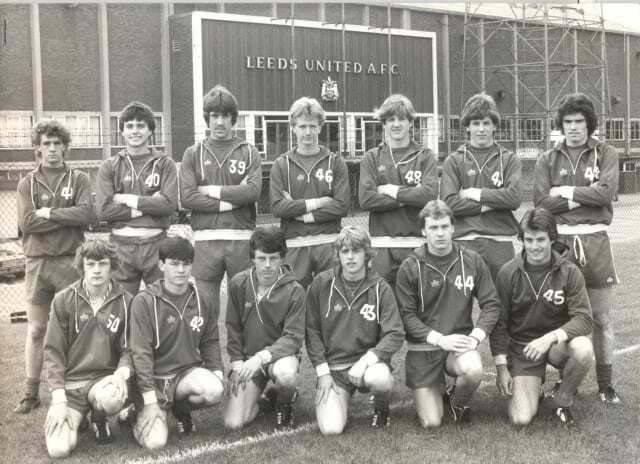 I used to follow Leeds Reserves and Youth teams in the 70's, 80's and 90's. Your pic - back row, Ashley Burrows, Simon Tait, David Seaman, Steve Cornes, Mark Hinchcliffe, Robert Peel, Brendan Carr. "The youth team was basically an u19 side playing in the Northern Intermediate League. "It would be made up of 1st and 2nd year apprentices aged 16-18 and 1st yr pros 18-19"
"I believe second from right, stood up, is Robert Peel. I went to school with him at Brigshaw comprehensive in Allerton Bywater and he ended up making one sub appearance at Southampton for the first team before being released. Last I heard many many years ago he had emigrated to New Zealand."